Somehow, I managed to finish 4 knitting projects in the last 3 weeks. I don’t think that’s ever happened before! First up, my K1C2 Ty-Dy socks made up in my own pattern. 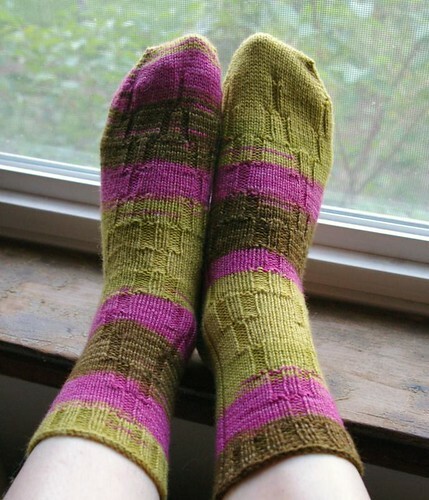 I knit the first sock back in September 08 and waited until this April to knit the second sock. I’m really quite pleased with these socks and know I will be wearing them a lot. I finished those the day before we left for vacation. 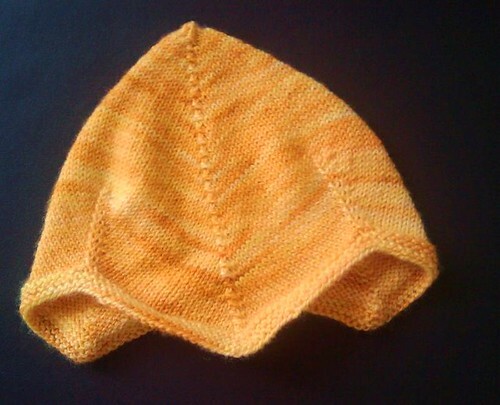 The next day, on our way to Florida I was able to finish my second Sweet Baby Cap, soaked it in the hotel bathroom sink that night and gave it not quite dry to Alyson for her future baby the next morning (see previous post for cool picture). The timing couldn’t have been better! 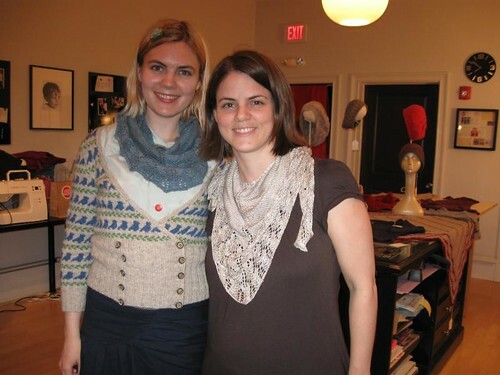 A few days ago, again with an incredible timing, I finished my Ishbel, just in time to meet Ysolda at Stitch House, a totally cool, new to me, yarn store. It was really fun meeting her, she’s got the prettiest Scottish accent and the best taste in shoes! I loved seeing and even trying out some of her samples. I just might have to make her Liesl cardigan now! Last but not least, another pair of socks. I started working on the first sock in November 08 and didn’t finish it until the cruise a couple weeks ago. I promptly cast on for the second one and now they’re both done! I don’t think I’ve ever cast on for sock #2 the same day I bind off sock #1, it’s definitely a good way to finishing a pair of socks in a short amount of time! I only have 3 WIPs left now, that feels quite good! Great photo with your Ishbels! You’ve been busy! The socks are pretty, and you should show the shawl spread out so we can see what it looks like. Congratulations! Everything looks great. Isn’t it satisfying to say “check, check, check!” on your WIP? I lurve the second socks!! Fabby! I love the yarn for the Herringbone Socks and the baby hat is a great color! The picture of Ysolde and yourself is very sweet. How did you like your TyDy yarn? That’s alot of knitting! Your socks look great. Glad you enjoyed your cruise! My parents love the Disney cruises and have only good things to say about them. Chris and I took one from Norwegian, which wasn’t nearly as nice. Congratulations on finishing so many WIPs!